Location: out in the sticks and flat lands of va wondering around for an open field or pavement!!! From spending hours on a dyno and different dyno's at that I found out on a 2.5-2.7L engine there is about 15 hp per pound of boost(I think there was a wonder to this earlier in this tread). For a 3L engine I do not know haven't spent that much time on a dyno with one. Didn't your 951 make like 110hp on the Dyno Costas?? LOL. It seems there has been alot of "kidding" around here. Evil 944 needs to get the project done. 1000hp dyno would be fun. And clearly. A.Wayne's right. A dyno Shootout is it's own animal. Max wins. But at the track... As TMS and Tool proved. There's a big difference between max, and usable. This is why I like track times and 1/4 mile times. Who can actually use their power. Let's have a little year end review. Two major breakthroughs in 08” were, # 1 a 951 finally reached the 600rwhp mark, than a 1000whp 928 broke a record @ the ¼ mile. 2008 was the year when the first e85 951’s came to the show, one driven by blowme944 and his famous videos, which are filmed under the poorest light possible and are preceded by 10-20 minutes of speech by blowme944 , also on the videos you can see the boost gauge raising to 30 psi but the speed of the car remain constant???. Hopefully blowme944 will make it to the strip by the end of 2009 after fixing his #17 blown head gasket. Also 2008 was a year of broken promises gayvil944T promised a 1000hp engine and we have seen sh&t yet. Pms951 promised to move out of his mom’s attic but still there so far. Tool promised to blow everyone at the fest after faking that he was parting his car, but his car only put down [email protected] wheels, a record established by tinyG when he was barely 30 years old and 4ft high almost 30 years ago in his 1st 951. Location: Probably in my shop. Lart did you get my PM? Get it right. 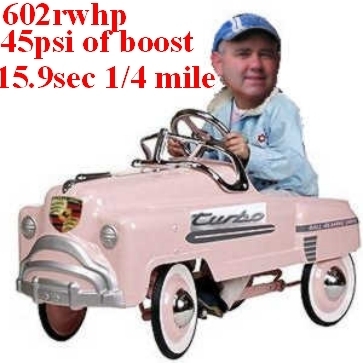 I asked if anyone would like to see a 1000rwhp build and after 3 days of people telling me it can't be done and one person getting banned, I stopped posting about it on RL, end of story.. To many haters around here..
pa - I need a starter ring, email me back!! Oh god. I would LOOOOOOVE to take you up on that offer. But it might be a bit un-fair. My car will be back out in the spring on super steroids. If things go right. End of summer in Sebring? You live down there? I buy dinner and lunch and your day at the track. You furnish sleeping arrangements. I will take you up on your offer. Just not any time soon. I'll tell you what. I break in under 2:00 in a 2 day event, You pay for everything. Whose ***** are shrinking now!? LOL - STRICTLY a fun joke for the video. Or maybe you come on Over to Houston? Texas World Speedway? Houston Motorsport ranch? Grand Sport Speedway? this could be as soon as May or June? oh yeah. Classic part of the movie. Love it. Last edited by 95ONE; 01-03-2009 at 01:24 AM. I'm equally dis-appointed and happy you didn't mention me. Yes but that guy is asking way to much. Do you have one cheaper? LOL........ It's a dyno shoot out , highest number wins ! Yep. But would probably get more entries if there are different classes... otherwise it won't be much of a shoot-out if only three people dyno. Mr A W. Will you have your 951 down there too? You should get out more to the world class circuits , you will have a batter idea of how competitive your lap times are and i do believe the 951 /968 record @ Sebring is 2:12 -13 if memory serves me right...get under 2 Yes i think yours say replica ! Clearly I've never driven there. (been there though) But this is where I got the track time estimates from. I'm sure you're talking about a different variation of the course than these guys. It does say "short" course. Last edited by 95ONE; 01-03-2009 at 04:30 PM. You have to earn it, not everybody has the honor to be on lart's most famous list.